When the world's urban population is growing by two people every second, Made.com is focusing on making room for the generation whose home is no longer their castle. If the American Dream is woven from the ideals of democracy, liberty and equality, marketers would be forgiven for believing that the British equivalent is based on little more than buying a home and selling it for a substantial profit. UK property prices, like the weather, are a national obsession. However, according to data from the Office for National Statistics, UK home ownership is falling among 25- to 34-year-olds for the first time in a century. In 1991, 67% of the 25-34 age group were homeowners. By the financial year ending 2014, this had declined to 36%. With home ownership increasingly out of reach for many young people, a new breed of consumer – "Generation Squeeze" – are trading in an obsession with getting on the property ladder for seeing their home, however cramped or temporary, as an expression of who they are, not what they own. 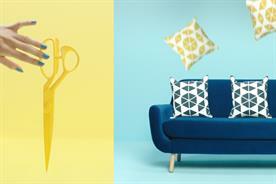 Annabel Kilner, commercial director at online furniture retailer Made.com, says social media has created an aspirational platform that is driving a shift among consumers who are not simply bragging about what they own but instead showing how they live. Whereas the ultimate status symbol may once have been the car in the driveway, creating and sharing the perfect picture of your urban lifestyle has become a key focus for consumers at a time when space is at a premium. "Social media has created that aspirational platform for people to showcase how they live," Kilner explains. Generation Squeeze are not only showcasing their homes as a means for self-expression but as a source of potential income. According to Kilner, the advent of the sharing economy is having a huge impact on global design trends. She explains: "Airbnb is about opening up your home, and that means it needs to look good, and mainstream consumers are taking design more seriously." So while a mortgage might be out of reach, shoppers are prepared to invest in standout furniture and design. Jonathan Openshaw, editorial director at The Future Laboratory, says that this trend represents a significant change in consumer identity, when home ownership has historically been such a key part of the British psyche. According to him, younger consumers are shedding these traditional values in favour of digitally driven global identities where aspiration is less fixed. Openshaw explains: "The third wave of globalisation is all about the individual and the power of people sharing their identity and feelings through social. This is driving an erosion of classic British values." However, while the dawn of the sharing economy and the shift from a society built on ownership of products to access to products offers new opportunities for brands, it is important not to ignore its dark underbelly. At a time when trust in brands and institutions is low, Openshaw says the question is whether the rise of new urban living spaces and the sharing economy are little more than placing a "sticking plaster over a gaping wound in our society". According to the Royal Institute of British Architects, the average one-bedroom new-build home is currently 46 square metres: the size of a carriage on the London Underground’s Jubilee Line. As consumers’ homes have shrunk, so their lifestyle choices and purchasing habits have changed. "We recognise that people’s living spaces are getting smaller and we have responded with very functional furniture," Kilner explains. Made.com’s bestselling products include sofa beds and multifunctional products such as extending dining tables and desk shelves. Such is the focus on the demands of this burgeoning urban market that this year the brief for the brand’s Emerging Talent Award, which will be unveiled this week to coincide with The London Design Festival, asked designers to come up with products specifically targeted to urban living. As a made-to-order business, Made.com’s lean business model relies on consumer data to inform both design and the depth of products available. And it appears to be paying off: sales jumped by 44% year on year to £61.6m in 2015. Kilner says the six-year-old brand remains focused on a dynamic product cycle with a relentless focus on design, driven by its in-house team. 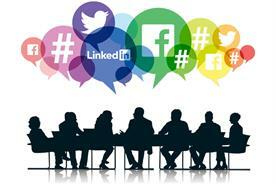 She explains: "Product curation on social media channels helps people think about how they can use their space more. We are increasingly seeing it is the little things – a standout piece of copper cutlery or some beautiful bed linen – that are cutting through." Conversely, at a time when the space each consumer occupies in a city is shrinking, the virtual space afforded by digital platforms to express themselves and reaffirm their sense of self is growing. 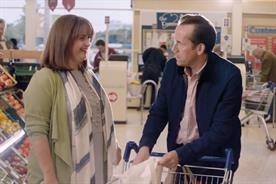 By capitalising on this trend, Made.com has found a sweet – yet squeezed – spot in consumers’ lives. 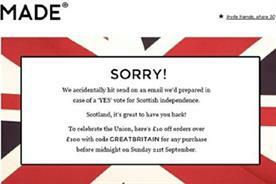 Made.com makes Scottish Referendum marketing "blunder"